You have arrived at SPORTS in the Algarve. This makes a fantastic holiday especially for large groups and is very popular for stag and hen parties.No reason why families should not try it as well.Please click here for quad biking tours in the Algarve>A drivers licence is needed for the tours.You can rent by the hour or for longer periods.The tour operators say people keep coming back for more.Go on! Give it a go!Spoil yourselves. (The company who arranges tours via the above link. )Welcome to the start of your quad bike experience in Portugal. We offer guided quad biking trips in one of the most spectacular parts of the Algarve with a choice of technical and scenic off road quad bike treks. ProRent makes you explore the Algarve countryside like nobody else can. Let our experienced guide takes you into the heart of the Algarve, discover beautiful old villages and unspoiled area where orange and olives groves, fig, almond and carob trees are drawing the scenery, with first-hand knowledge of the region’s best rides and the right gear and safety procedures in place. ProRent quad bike adventure offers the best experience on four wheels you’ll ever have. The quads provided are fully automatic and are capable of carrying two people comfortably, so are ideal for the novice and advanced riders. Our tours are suitable for everyone including, groups, individuals, families, stag and hen parties, corporate events, or a group of friends getting together to have a fun day out. The thing about quad bike is that, where horses are unpredictable, 4X4 can stall and bicycle can be tiring, quad bike are all terrain, comfortable to drive, meaning you use little physical effort and get to enjoy every moment to the max. If you enjoy a challenge or are more experienced, a route to suit your level of comfort will be taken. If you are a less adventurous quad biker, not to worry, there are enough flat road and smaller hills to go round. Explore on your ownIf you don’t want to go out as part of an organized tour and would rather explore on your own, the quad bikes can be hired independently. Water activities are world class here in the algarve.They are carried out all along the coast but the west end is the favourite.The west is stuck right out in the breezy part of the Atlantic ocean.The coast is really rugged on this end.Bearing testament to the violent waves ripping into the shoreline.This is the place for the avid surfers and wind surfers.Just about every form of water activity is carried out on this wild end.The less adventurous or inexperienced can find gentler conditions in the central and East Algarve regions. For surfers There is the Algarve Surf School Visit them on this link for Great surfing,surfing courses and Famous kids camp .We think they are a superb outfit who should be more than capable of filling your needs. They have a full surfing package for experienced surfers.At the end of June each year they have their famous kids camp.You can stay at their own accomodation near Sagres and book 1 or 2 week surf courses.They prefer you to book for Sunday arrival as course lessons start on monday mornings.Give them a go we think you will not regret doing so. Formula 1.Bernie ecclestone is apparently working hard to bring the Racing back to the Algarve.It seems likely it will happen.Tennis courts abound all over the region.So you will always be able to get a game but for some reason the game does not seem to be that big with the Portuguese.Football.Now most people must be aware that this is virtually the Portuguese religion.You will always be able to find a pitch to have a game.You will find seven a side hard football pitches everywhere.Very often they have floodlights.This availability of pitches explains why the Portuguese tend to be so gifted at football.Fishing.This is the place for fishing.Obviously the Atlantic is available all along the Algarve.So sea fishing is a big pastime and you will never have any trouble getting hold of a boat owner to take you out.The region is also a paradise for river fishing.The rivers are not polluted by industry.Tourism is the only major industry here.There are many nature reserves for the angler to explore.In particular the Ria Formosa in the East Algarve.More SPORTS will be added soon. This is a very exciting sport to have a go at.The sheer excitement when you find you have hooked a monster and the amazing pulse throbbing thrill of the chase,is hard to exaggerate.If you have never tried it give yourself a real treat. As you can see not everyone has to take part so you can take the family for a boat trip while you have a go at this amazing sport.You can have a nice lunch on board for around 8.50 per head for example you would have chicken piri piri plus crisps plus bread and fruit. 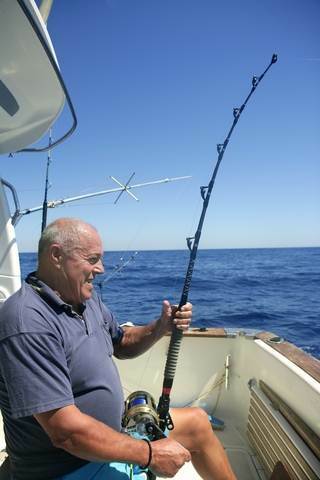 You can choose many types of fishing,for example shark fishing,bottom fishing,tuna or marlin fishing and big parties can charter a boat if they can afford it. Below,remove the "geezer" having all the fun and picture yourself in that seat.An experience of a lifetime "or what"!